NOTE: If you haven't already done the Widow's Tears Mission, the mission giver will be revealed when you enter this area. You can do that mission while you're in the area, then continue with the Ancient Studies mission, or finish this one before starting the next. Before heading out, make sure you have enough herbs and arrow-making supplies in your inventory, since you will soon have to fight a group of cultists. If you've already explored the Abandoned Village side area, you can fast travel to the Abandoned Village Base Camp, which is marked on the map screenshot above. Otherwise, head for the spot marked on the map, which is just southwest of the Fishing District Base Camp, and follow the muddy path to the village. 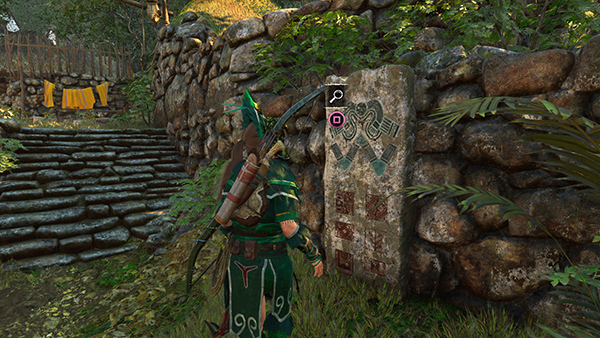 When you reach the village, your goal is updated: Enter the Ritual Site, which is then marked on your map. Approach the cultists, who are not hostile yet, and follow them down to the site to Begin the Ritual. 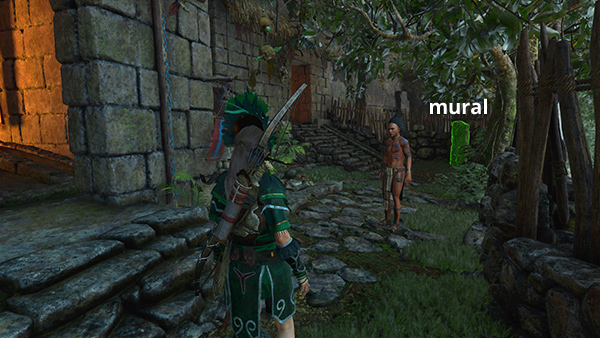 Lara speaks to Awil's father, who mistakes her for a real Serpent Guard. Then she tells Awil to run back to Mayu on her signal. If you haven't unlocked the Viper's Lure skill yet, just keep moving and pick off attackers as you go. This is a large area with lots of places to hide. Use fire arrows if things get rough, and don't forget that Lara can run away and re-enter stealth once she's out of her enemies' line of sight. After you've eliminated all of the cultists, you'll be prompted to Return to Awil and Mayu. Before leaving this area, search all the bodies, since the cultists carry feathers, herbs, and gold. NOTE: If you didn't explore this area earlier, there are also various collectibles, a wolf den on the far side of the pool to the north, and a Crypt. See the FIRST HIDDEN CITY WALKTHROUGH for details. Even if you did visit this area before, you may want to make another sweep, since some of the resources, including gold and jade will have respawned if you've been away long enough. When you're ready, either fast travel back to the Fishing District Base Camp or follow the path to the southeast to get back there. Swim out to the island and speak to Awil once more to complete the mission. Mayu gives Lara the HEART OF THE EAGLE BOW, which she inherited from her mother, an eagle archer, as well as 450 gold pieces.